That’s me on the left in September of 2010, deadlifting 145 pounds (about 65kg). And there’s me on the right just a few days ago, pulling 320 pounds (145kg). A lot can change in five years. That’s how long it’s been since I started this Paleo way of eating. In that time, my career and sport of choice have changed, I launched this website, I wrote two books about Paleo nutrition (one comes out next week), and I’ve learned a ton about life. I’ve made a boatload of mistakes, but I’ve had a lot of successes, too. Probably the most profound thing I’ve experienced is how Paleo’s morphed from a very strict yes / no list to something that’s 100% sustainable as a way of life. It’s how I live my every day, and it’s something I plan to keep doing…no end date in sight. No quick fix. No “lose seven pounds in seven days” mentality. No. 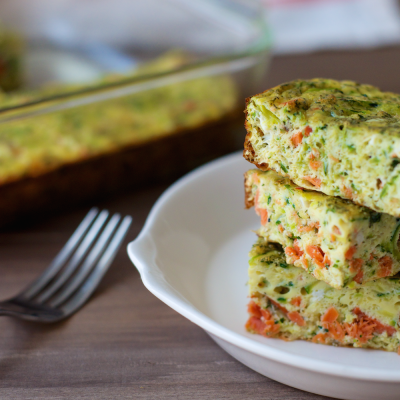 I “went Paleo” on January 10, 2010, a full year and a half before this blog existed. (Fun fact: I was writing and sharing recipes on my old blog far before that. Friends told me I should just make a food blog. True story.) I used to race mountain bikes, and two good friends of mine were talking about Paleo. It sounded crazy to me, but I read about it and decided to give it a try. So, I had my holiday fun and on 01-10-10, I started. How I eat today has definitely evolved. The lessons I’ve learned from five years of experimentation and tweaking are innumerable, so I’ve picked just the top five things to share with you. They’re nuggets I wish to pass along to you and to anyone getting started with—or veteran to—Paleo. You could also call this post, “Don’t Make the Same Silly Mistakes I Did,” but even with the most sage advice, there’s nothing like experiential learning. To paraphrase 37 Signals in their book Rework, “Mistakes are feedback.” They’re like data that we can use to adjust course. How freaking cool is that? 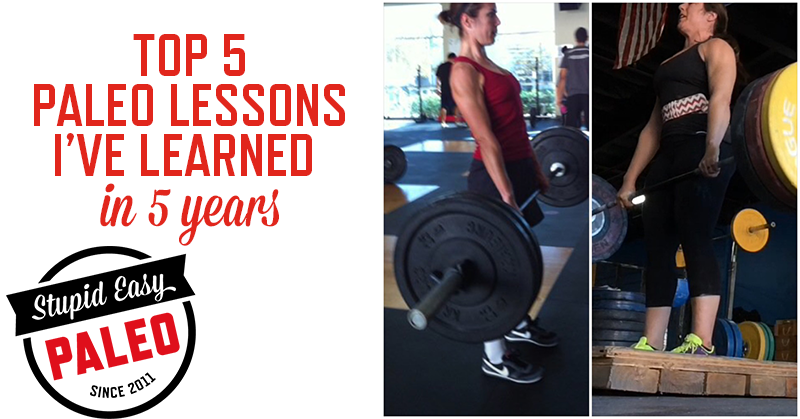 Anyhow, here are a few of the top 5 paleo lessons I’ve learned in the past five years. Lesson #1: Perfection is NOT the name of the game. I get it. When you first get started, there’s a delicate balance to be struck between staying true to the plan versus backstroking across an endless sea of donuts. And for some of us, the line between those seems about a millimeter wide. Maybe you’re worried that you’ll slip up forever and end up in some Twilight Zone version of a Betty Crocker nightmare, unable to escape a vortex of treats sucking you in. Maybe you’re trying really hard to exercise willpower instead of changing the mental framework you have around nutrition and adjusting your habits correspondingly. Eventually it peters out and leaves you exhausted, reaching for the phone to order takeout again. How do I know what this is like? It used to be me. I was really concerned with sticking to the yes / no list of foods I found in a book. What resulted was me not eating the foods I needed to support my goals. Specifically, I was too low carb as an athlete who was training upwards of 20 hours a week. I wasn’t eating enough protein. I could ride for hours, but I was weak as a baby. The only thing that saved me from messed up menstrual cycles was being on birth control pills. While my health was a lot better compared to when I wasn’t eating Paleo, I was missing out on my body’s own signals and what I needed to be healthier because I was so hell-bent on sticking to a list. Use a yes / no list as a basic framework to get started, but realize it’s a guideline. 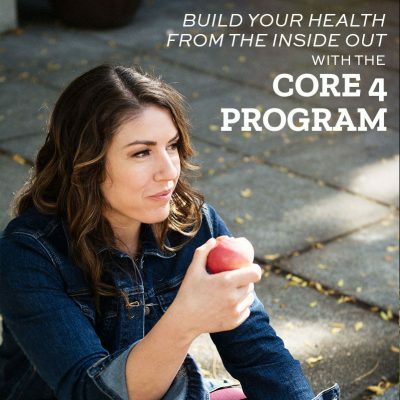 You will have to tweak that framework as your health and goals change. You will go off-plan at some point. You are not a bad, stupid, weak person because of it. You are a human living life in the real world, not in a bubble. Being stressed about your diet is one of the biggest mistakes you can make. If you root the vast majority of what you’re eating in meat, seafood, eggs; veggies and fruits; and healthy fats and do that long-term, that’s where the magic happens. Discipline and perfection are not the same thing. Make sense? Lesson #2: Learn how foods actually affect YOU. Taking the first lesson a bit further, sticking strictly to a list of yes / no foods you read in a book or on a website without peeking under your own “hood” first is like driving a car with your eyes closed. For that reason, I highly recommend doing a Whole30 or other elimination protocol, like the one listed in The Paleo Solution, before you really dive in. You’ll get a pretty accurate picture of how different foods affect you—for the better or worse—and decide which, if any foods, to avoid for the long-term. More importantly, you’ll find out how your body is supposed to feel—stable energy, good moods, healthy digestion, better sleep, etc.—when you take out all the processed, overly sugary, nutrient poor, inflammatory foods that are abundant in the Standard American Diet. You’ll give yourself time for annoyances to begin healing as you remove the foods that kept them around. Often, feeling better is the best motivation to keep going. Nobody wants to be stuck in an endless cycle of unrestricted indulgence followed by the ever-present challenge or detox. It’s a binge-and-restrict dressed up in a different package, and it’s really common in this community. On the contrary, when you truly make mindful change, learn about how foods affect you and nourish yourself with nutrient-dense food, you set yourself up long-term success. It’s easier to navigate a world full of cakes and sweets when you know that 1) though they may taste good, they make you feel terrible or 2) you’ll have it every once in a great while as a real “treat” then be back to your regularly scheduled program of nutritious food. Also, you may be stuffing your face with tomatoes and peppers only to find that they make your autoimmune condition worse. Or, perhaps a snack of jerky and kombucha puts your histamine levels over the top and you break out in a skin rash. For some people, foods widely encouraged in a Paleo way of eating just don’t work. It’s an even greater argument for paying attention to the biofeedback our own bodies give us. Take-away action: Schedule a 30-day elimination program toward the beginning of when you “go Paleo.” Write brief notes about what you eliminated and how it made you feel. At first you may feel terrible. But if you stick with it for a week or two, you should start to feel so. much. better. Then, reintroduce any foods you want (following the program rules) and note your reactions, both physical and mental. 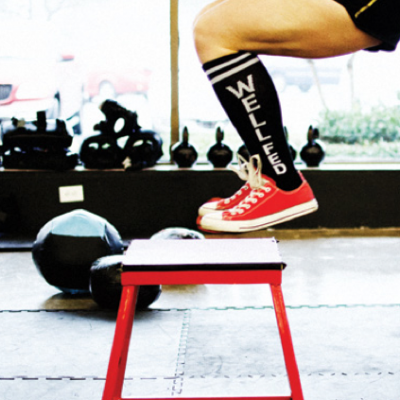 Use this information to make adjustments to your basic Paleo framework. Lesson #3: Paleo crap food is still crap food, just less crappy. I’m gonna come out and say the unpopular thing: Paleo junk food is still junk food. It may not be made with the same gluten-containing flour or the devil of all sweeteners, high fructose corn syrup, but even if it’s made if your kitchen, it’s still dessert. These treats are usually very high in fat and even with “natural” sweeteners, still spike blood sugar. Should you be expected to never have another piece of birthday cake for the rest of your life? No. Is a gluten-free, homemade, HFCS-free treat a better choice? Probably. Are these foods good choices for regular consumption? No. And sometimes, I think you should just eat the damn donut / cookie / cake / bread instead of the (let’s be honest) often unsatisfying recreation. I wrote an article all about that last year that ruffled some feathers. It’s worth a read. We eat, on average, 21 meals a week. That’s almost two dozen opportunities to fill our bellies with nutrient-dense foods that energize us at the cellular level and influence virtually every aspect of our health status. What we choose a majority of the time over a long period of time is what matters most. One last thing: The ingredients for Paleo-fied junk foods are often quite expensive and really don’t provide the same nutrient density as the staples. If you’re on a budget for time and / or money, skip the baking and treats. Take-away action: Save treats for special occasions. (Just because it’s a day that ends in “y” doesn’t qualify.) That way, they don’t become a regular feature of your diet. If you crave junk food because of stress, create new habits and responses to the situations that set you off. Jerkface boss giving you a hard time? Bills got you constantly worried? Instead of going to the kitchen, meditate for 10 minutes, take a walk or go take a warm shower. Be honest with yourself about your junk food intake (Paleo or otherwise). Look for Part 2—and some thoughts about where I’m going from here—soon! What are the most important Paleo lessons you’ve learned so far? Share it in the comments below! This is great! My husband and I started paleo last spring and it was amazing the difference it made in how we felt! Unfortunately, we really fell of the wagon on our vacation over the summer and never got back on all the way. We’re resetting and starting paleo again and these are some good tips to help us stay on the right direction without getting burnt out. One thing we are doing is adding regular gluten-free cheats like white potatoes and corn. I’ve found that I really need a bit more carbs in my diet or I get crazy carb cravings and usually end up eating something really bad. I’m also a very picky eater but I decided to give all healthy foods a try to see if my tastes have changed. I’ve found that I actually like some things I had thought I hated and that I can handle others if they are mixed in with other things. So I think going into paleo with the mindset that you are going to change the way you look at food rather than you are going on a diet is very helpful. Hi Stephanie! Good to hear you’re planning to get back on track. I’m curious why white potato is a cheat? It’s nutritious…not anywhere near dessert! Seems like you’ve made great strides…here’s to 2015! It’s one of those things I’ve seen on the “bad” list for paleo diets. I’ve never quite figured out why. Guess I’ll have to put them on my good list! Thanks so much! I’ve read a lot of good stuff about a lot of the other foods that are no-nos on the paleo diet but I could never figure out the potato thing. I definitely had issues when I was on the pill, but I think it saved me from being 100% messed up. I guess I feel like I need a Whole30 because the strict guidelines force me to “get back to the basics”, and getting back to healthy eating reminds me of how much better my body feels and performs when I’m fueling it correctly. Without being “forced” to give up paleo treats, I convince myself that I’m at the top of my game, just so I can indulge. Whole30 reminds me that I don’t feel my best when indulging too often, and it has also helped teach me how to indulge “when I want” with better choices. I feel better and better during and after each round of Whole30, and I find myself gravitating back to the Whole30 challenge due to excitement – and no longer out of desperation. I’m so glad that you gave everything another shot back in February. What a huge change in mindset and in practice! Thanks for sharing your thoughts on it and have a wonderful New Year! Thanks for the post! It really helps to hear from a seasoned paleo er about it being ok to make adjustments for your own lifestyle and needs. I have only been paleo for 6 mths and have cured my fibro, gerd and constipation issues through the practice. Its winter and very cold where I live. I have been struggling with feeling hungry and chilled to the bone. I just decided this morning that I would make one of my all time favorite soups even though it contains beans. Then up comes your post in my email box so now…….no guilt with cooking or eating this soup. Hi Beth! You’re very welcome. I hope your soup was delicious and satisfying and that you were able to enjoy it 100%. Have a wonderful new year! This is a really great post with a lot of really sane advice. 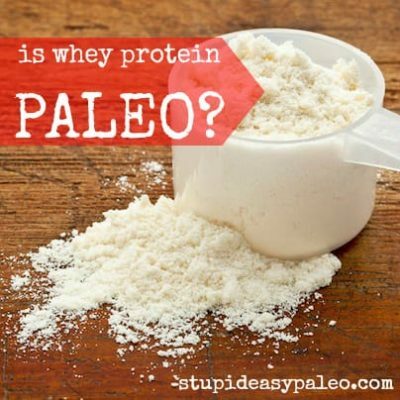 I do not follow the paleo protocol, because some of the foods that are eliminated are one I like and find useful and can tolerate (beans and dairy, for example). However, I do believe very strongly in eating whole foods that are nutrient dense, and that is generally how I eat. 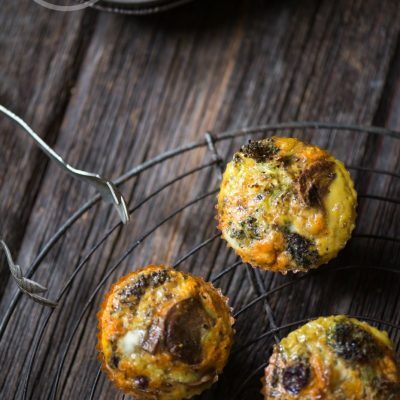 One of the things that has driven me crazy about some of the paleo blogs is that they are always posting recipes for baked treats. Not only do those recipes seem convoluted, but they really don’t help anyone get away from the lifestyle created by processed foods. I thought the point of paleo was to get away from the processed food lifestyle. I appreciate your sanity, especially with regard to being flexible and not being a perfectionist. Thank you Susan! I really like the idea of calling it nutrient-dense or something else…just because it’s a bit confusing to call things Paleo in this day and age. I totally agree with you…those paleoified processed foods don’t really allow folks to start making new habits. Wishing you all the best! Hi Claire…Wordpress.com is great (and free) when you’re first starting. Best of luck and happy new year! My biggest mistake is/was definitely not eating enough on paleo (oddly this didn’t happen when I started but more recently), especially when it comes to healthy fats and carbs. 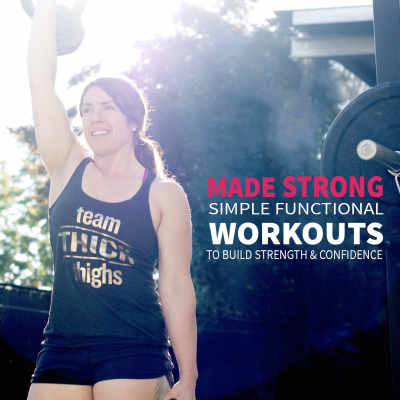 I didn’t fuel my body enough when I increased workouts/activities and lost a lot of weight (that I did not need to lose), all my strength and my body is shutting down. Trying to recover in a healthy way now. Thank you so much for this post. It’s great! I’ve been doing Paleo for almost a year and never done a Whole30. Your post has really motivated me as I could see I’m probably making the same mistakes. Hi Gabriela! Wow that’s awesome. I hope you find it enlightening 🙂 Happy New Year! 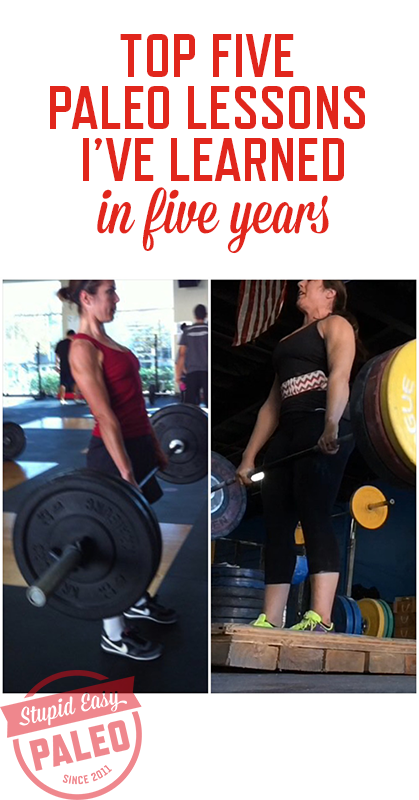 I would love to hear your thoughts and opinions about women crossfitters and women olympic lifters and their changing and “different from the typical cardio bunny” bodies. You know what I mean… #quadzilla… I think it’s a really sensitive topic and I think you would be the perfect person to address it. 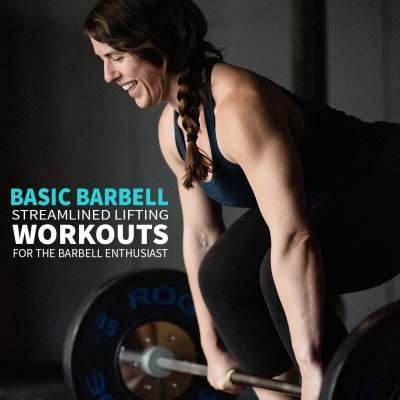 My crossfitting/olympic lifting friends and I are constantly struggling because we want to be stronger and better lifters, but others (mostly other women) judge us “built/jacked girls.” It’s a shame because olympic lifting gives me so much confidence, but I am also criticized and scrutinized because of my figure. Perhaps a blog post on this topic? Thanks for responding 🙂 I can’t wait to read your thoughts! I’ve been eating 80/20 paleo for a few years now, including a 4-week stint on doctor-ordered AIP–during which I felt amazing, but since I totally blew the reintroduction phase, I STILL don’t know my personal sensitivities. I’m finally ready to do a proper Whole 30 and I’m starting one next week. Love these tips! Also, didn’t know you mountain biked! I’ve been racing for two years but with inconsistent training (and inconsistent results!). Getting serious this year. So pumped for your book. Hi Steph this is just a great article! You are amazing and have helped me countless times staying in track with your delicious recipes and amazing posts! I am so thankful! I started my paleo journey almost a year ago and it to say it has changed my life is such an understatement! My best friend (more like my sister) is a triathlete that has an increible passion for what she does. A few days ago when i told her i had finishes my first whole30 she said her coach had suggested she started eating paleo since she was having some health and performanc issues , she told me she hadnt had her period for a year now and that she was suffering from anemia and that she also had an injury in her heel that didnt seem to heal and that it was affecting her health and her perfomance, she doesnt eat red meat and i think is undereating for the amount of excercice she does! Cant a whole30 help her? Can she still take her protein shakes since she doesnt eat much meat rather than the occasional fish or chicken and eggs? She doesnt include any fat on her meals which i think is a huge part of the problem since leptin and estrogen are essential for the good funcionning of you period and they are produced in fat cells i am really concerned about her but i have no idea how to help her out! Any advice? I suggested her to get your performance cookbook! Got mine and i just fell in love with it! This whole article sang to me, all the way down to the eating Trader Joes mangoes in 3 minutes. 🙂 thank you for your thoughts. I have a long ways to go but I’ve also come pretty far! I recently started going paleo to clean up my diet and establish good eating habits as I get older (I’m in highschool). However, it’s left me feeling really hungry and head ache-y with blood sugar level drops all of the time. I wanted to start eating paleo to help me feel more energetic ect., but instead it’s left me the exact opposite. I want to keep eating paleo, but it hasn’t worked for me. Any advice? When you say “eat paleo” I really have no idea what you’re eating since this term means so many things. You might not be eating enough (a common problem because people treat this as a “diet”) or you may not be getting enough carb intake (especially if you are physically active). My best advice is to work with a coach to look into it further and give you some guidance. I have coaching packages in the Store if you want to take a closer look. Can you describe what you’re eating on an average day?